Published in the book 21 Games For The BBC Micro by Mike James, S. M. Gee and Kay Ewbank, published by Granada Publishing Ltd. This game provides the ideal type of target practice. However many times you score a direct hit, the magic bird continues to fly on, allowing you to take aim and fire again and again. 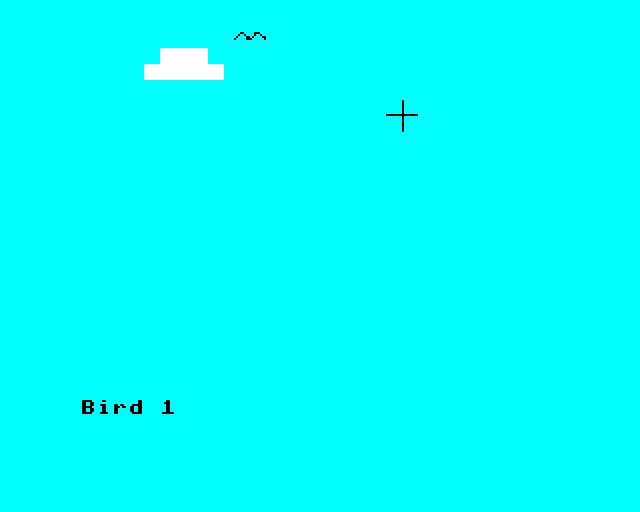 The elements of this game are simple − a blue sky with a single white cloud, a bird winging its way from left to right and your rifle sight. The object is straightforward − to line up the sight with the bird and shoot it − but in practice its not that simple. Every time you fire, your rifle ‘kicks’ to one side or the other so you have to re-align your sight for your next shot and the bird (and your sight too) disappears behind the cloud when they reach it. A total of five birds fly across the sky and there is no limit to the number of hits you can score − your total for each bird and the whole game are displayed at the end. There is a convincing sound every time you fire your rifle and a distinctive bell-like sound when you hit the bird. To hit the target you have to line the cross point of your sight up with the centre of the bird. Use all four arrow keys to move your sight and press ‘F’ to fire. There are five birds in all and you may hit each one as often as you can.